This excerpt is intended as an acclaim from Drum Major Francis Richards (ret) for the indefatigable spirit of our beloved Bandmaster of the Dominica Government Band (ret) Ruben Hesketh Casimir on the occasion of his 100th birthday. In spite of the effects of a stroke which affected his mobility, my father – Bandsman Clement Richards (deceased) assigned me the responsibility to carry his instrument (the baritone) to every band practice then located on the compound of the old Roseau Boys School (corner of Hillsborough Street and Great George Street). It was then inevitable that I would be enrolled as a bandsman following the preceding footprints of three other family members. For a period of approximately 30 years I along with several other bandsmen experienced knowingly or subconsciously the invaluable mentorship of 'Bandmaster' as he was called with reverence and respect. Bandmaster exemplified the ultimate in leadership from in front, by always being the one to undertake the apparent difficult tasks whether the sources were from officialdom or unofficial. His indomitable spirit of 'can-do' it's 'our duty for country' empowered the thirty plus band (male and female) to rise to every occasion setting aside our individual preferences big or small. 'Fall in! Forward we go'. 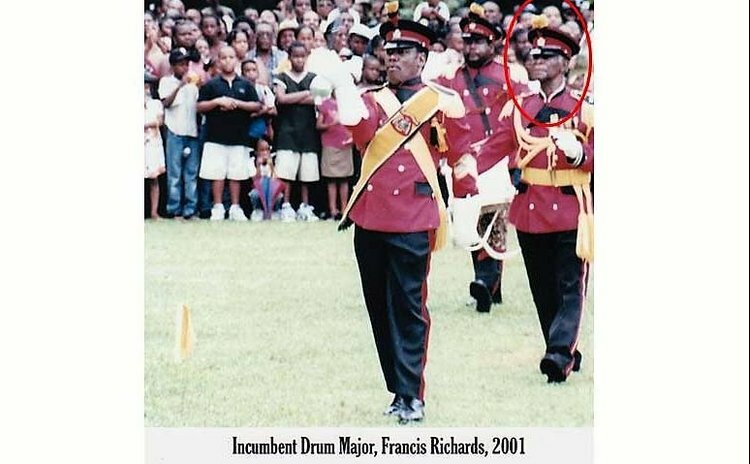 Bandmaster was the epitome of his musical competence, especially martial music through practical demonstrations, individual and collective coaching. As a team leader, he was a stickler for the correct carriage of uniform, respect for the hierarchical structure of the military / police and adherence to the established discipline of drill and public performances. During my tenure, I can attest to his unrelenting, selfless pursuit of band first (instruments and bandsmen) oftentimes relegating his family, himself, his health, his home, his business, his recreation to second place. We witnessed the gradual mutilation of the interior of several of his vehicles by the improper and oftentimes inadvertent scrapings and cuts from the transportation of band instruments to and from events. – Bandmaster 'carried on smartly' almost as a consequence of collateral damage i.e. let's get the job done. I was certainly unaware of the commensurate compensation if any existed. As a tough no-nonsense person, intolerant for dereliction of duty, bandmaster also when the occasion arose would demonstrate genuine concern for the welfare of his bandsmen/women and their extended families from the youngest to the eldest. He was not afraid to respectfully present his cases of discontent to the governing authority; one such occasion being the deposit of all musical instruments in his possession at the ground floor of the Govt. headquarters as a demonstration of protest. Alternatively, with similar fervor he would rally the sometimes protesting bandsmen to rise to the occasion as the exigencies of the call up orders demanded. If I may speak for my cohort, we deeply reverence and highly appreciate the opportunity afforded us to have served under the baton and tutelage of Bandmaster R. H. Casimir at mandatory bi-weekly practice sessions, national parades, official events, annual Christmas island-wide tours, weddings, funerals, carnival band parades, varied concerts. As a national icon, recipient of the meritorious service award, the legacy of Mr. Casimir must find a place for posterity in the annuls of our historical documentation to include his unquestionable contributions especially in the areas of education and business (Cee Bees Book Store), social entertainment (Casimir Brothers) and other undocumented activities. On the occasion of his enviable milestone – 100 years on October 30, 2018 it is with the deepest pleasure that my family and myself wish our beloved a HAPPY BIRTHDAY with many more to come. PS. It would be a most fitting manifestation of gratitude from the State to construct and name the long overdue facility as the R. H. Casimir Bandhouse.